Sita's Ramayana is a unique re-telling of the epic from a woman's perspective. Images © Tara Books. In a virtual galaxy of book publishers hawking their wares in bookstores these days, Tara Books editions illuminate India’s rich and vibrant visual culture. An impressive catalogue that straddles fantasy, fiction, poetry, folklore, visual arts and design, each publication is created through the effort of academics, anthropologists, writers, artists and designers working together. Founded by academic Gita Wolf in 1994, Tara Books is the country’s most famous small publisher among art-lovers abroad. Tara Books’ publications constantly redefine the cultural value of books as objects and signifiers in an increasingly information-driven world. Not merely content to print books, they fuse modern book-making with tribal art, bring traditional story-telling to printed pages, convert performance scrolls into accordion books that can be read as graphic novels and use publishing as a vital tool in bringing about social awareness. They are best known for books created by tribal artists in the Gond, Patua and Mithila styles and their most popular titles include the London Jungle Book and The Nightlife of Trees. The Nightlife of Trees is entirely handmade, from the paper to the packaging. 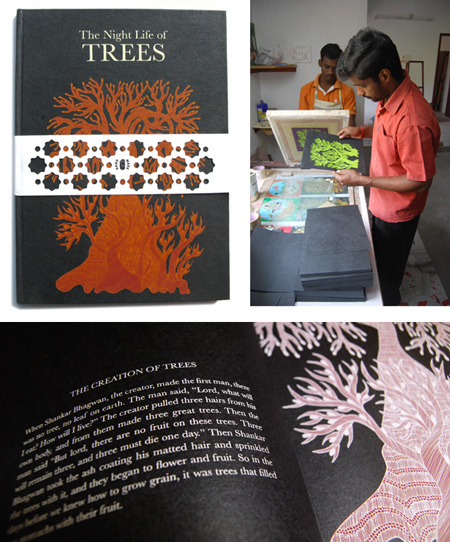 A collection of Gond folklore, each spread presents a sacred tree and its significance for the community. Images © Tara Books. From conception to production, each book represents a process of collaboration that involves continuous conversations and commitment. Artists create original artworks in collaboration with writers and many books are silk screen-printed in-house. The Nightlife of Trees for example, was developed from paintings by Gond artists Ram Singh Urveti, Bhaju Shyam and Durga Bai. Each painting relates to a particular tree and is accompanied by the folkloric significance of that tree. Taken together, the book is an insight into the Gond perception of the cosmos and the tribe’s relationship to nature. Now in its ninth edition, this hand-printed book has shared a different world view with its readers and encouraged a new way in which the Gond tradition may live on in an urban ecology. Books such as these come from mutual respect and collaboration that the Chennai-based publishers strive to encourage in their workspace. 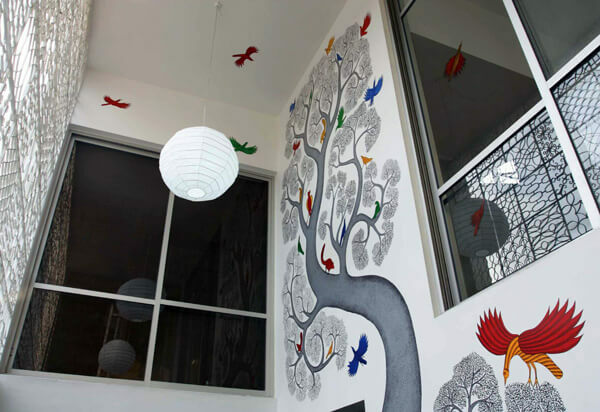 They commissioned the Madras Office for Architects and Designers to design a multifunctional building that would reflect their process and nurture the collective’s spirit. The project resulted in the newly opened Book Building. A welcome change from the rented offices and studios they once occupied, this new 400 sq.mt. building houses the publishers’ offices, rooms for workshops, galleries for exhibitions and dormitories for resident artists. The bookstore doubles up as a gallery space in the new Book Building. Image ©MOAD. Patterns cover every sunlit surface like a page from one of Tara's books. Image © MOAD. The Book Building has been conceived as a space in which to live and breathe and build books. 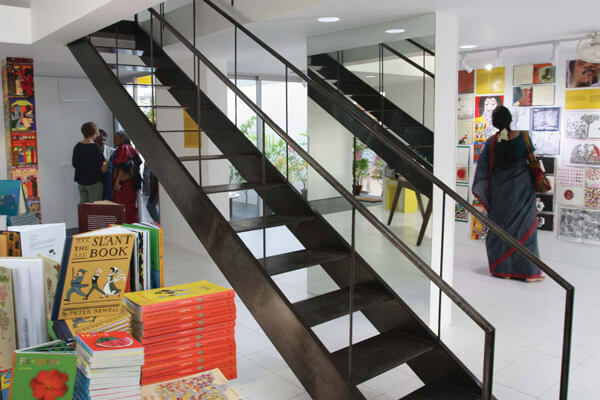 The bookstore doubles up as a gallery for Tara’s publications and artworks from various editions adorn the walls. 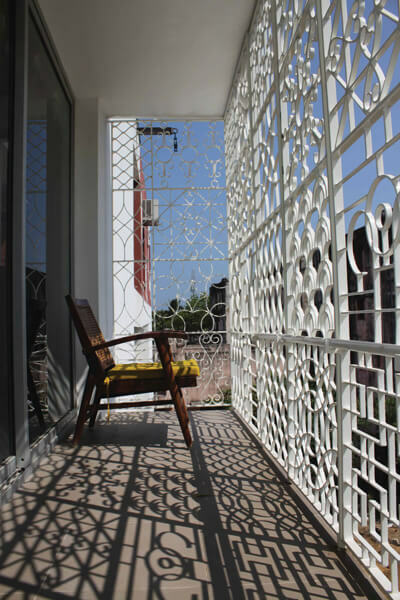 Jali-like grills filter light into the space leaving behind patterns on every surface, an 8-meter tall mural by artist Bhajju Shyam adorns an atrium wall white painted Patua panels turn columns into story scrolls. The fluidly designed ground floor of the building will enable a cross-fertilization of ideas, while the rest of the building provides a singular home to the collective’s philosophy. Indeed, the building itself looks like one of Tara Books’ own publications, filled with art, dreams and stories. In the spirit of sharing, Tara Books hopes to involve the community in celebrating Indian stories with an exciting line-up of exhibitions, talks and events. As readers, writers, artists and publishers begin to occupy this space, literature, architecture and art will come together to build new books in the Book Building. Mahesh Radhakrishnan, the principle architect of the Book Building will speak about the process of creating a new home for Tara Books on the 28th of April, 2012 at the Book Building. More information can be found here. Read my other writing about new Indian graphic novels and visual books on Little Design Book.